Our company has been acting in the nonwoven fabric market of Ukraine for more than a decade. For this time we have created a truly stable and reliable company that works with leading global manufacturers. We pursue the course of development and improvement of our own production, purchase new equipment, automate production processes, organize our workers to quickly respond to customers' needs and wishes. Partnership with us helps find loyal customers, make business safe, be sure in provider's competency and in the future. 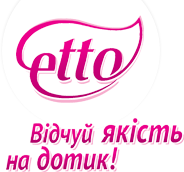 One of the company's priorities is manufacturing of disposable products for beauty industry under Etto TM. Application of Etto TM products significantly increases the overall culture of cosmetic and medical care, provides with hygienic safety, facilitates the staff work, makes achieve significant savings in washing and disinfection preparations, reduces time to prepare for procedures. Etto TM products of nonwoven fabric are hypoallergenic, hygroscopic, provide comfortable tactile sensation, have superior aesthetic and consumer characteristics, do not become electric, are sanitary and safe.